While studying at the Royal College of Music, I became interested in the history and development of the trombone. Arthur Wilson, Professor of Trombone at the RCM and Principal Trombone of the Philharmonia Orchestra, and one of my teachers, was one of the very few players who still played the alto trombone in the symphony orchestra during the late 1970s. I absolutely adored this instrument (and its distinctive colour), which led me to explore other endangered species, like the sackbut. My first electrifying experience of playing on period instruments with the Monteverdi Choir and Orchestra set me on a path of discovery and experimentation. Further exploration led me to the Royal College of Music Museum, where there were two tarnished silver 19th century trombones, identical to the one I had found in my school’s music-room cupboard at the tender age of fifteen. 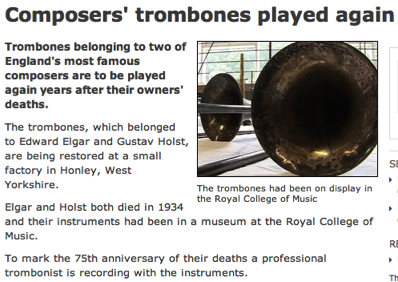 These RCM trombones had belonged to two of England’s finest composers: Sir Edward Elgar and Gustav Holst. In November 2009 the Orchestra of the Age of Enlightenment decided to perform Elgar’s The Dream of Gerontius. This prompted a revisit to the RCM museum and Jenny Nex, the Curator, granted me permission to use Elgar’s trombone for that project. 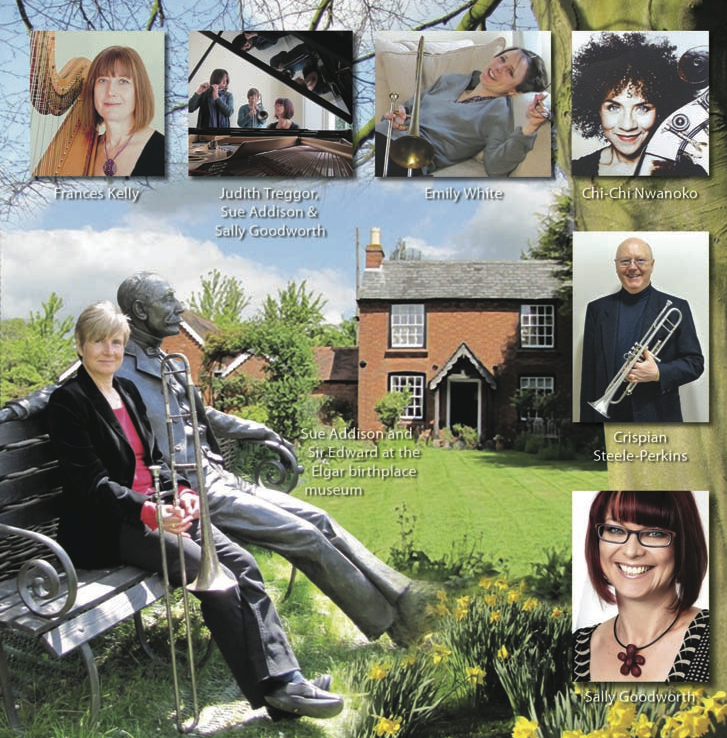 It was from this experience that I felt a need to explore further the world of the 19th century English trombone and the music that was written for it. What better way than through the stories and music of Elgar and Holst and their exposure to playing such an instrument? When researching the music for this project, I wanted to rely on one of Elgar’s greatest strengths: his ability to write very beautiful melodies. Unfortunately, most were written for violin, cello, piano, voice and full orchestra, but certainly not for the trombone. I explored the works of his contemporaries and also found equally stunning tunes, well-suited to the trombone but again not written expressly for it. As I felt the melodic quality of the music was a priority, I decided to arrange some of this early 20th century repertoire and use it as a showcase for the instrument that Elgar himself played. While it is well documented that as a boy Elgar (1857–1934) played violin, piano, organ and bassoon, there is no evidence that he played the trombone in early life. The first known record of Elgar playing the trombone can be found in a letter to his publisher, Jaeger, dated December 7th 1900, where he writes: “P.S. I’m learning the trombone.” This suggests that Elgar probably didn’t take up the instrument until the age of forty-three, and it also means there is an eight-year period from when Elgar’s particular instrument was polished and completed until the time it came into his possession. Who knows if it had been collecting dust on a shop shelf or whether it had a loving owner before it came into the ownership of Sir Edward? It is very unlikely that the sales receipt will ever turn up. How fortunate for us that Elgar rather enjoyed having his picture taken so we at least have a photograph of him playing the trombone, as seen on the cover of this CD. Cartoon by Elgar sent to Jaeger. I went out of the room as quickly as I could and sat on the stairs, clinging to the banisters till the pain eased, but it was no good. I couldn’t stop there as he went on making comic noises, so I went downstairs out of earshot for a bit. A little later on in 1904... it was about the time he was writing Falstaff, just after the Second Symphony and the Violin Concerto, that Elgar took trombone lessons with Mr Lettington, bass trombone in the London Symphony Orchestra at the time, and it may be that Mr Lettington introduced him to use the tenor clef for his first and second trombones in Falstaff, though years later, in 1932, he again wrote for all three in the bass clef in the Nursery Suite. This information was kindly forwarded to me by Mr Lettington’s grandson. He also informed me that his grandfather died suddenly on the 16th July 1904 leaving his grandmother with four children under the age of ten, and one yet to be born. In those straitened circumstances, she was obliged to sell his instruments. The bottom of a joke letter written by Elgar in the guise of made-up persons, testifying to his typewriting and trombone-playing abilities. During the 1914-18 war a Mr Herman Darewski was appointed Honorary Organiser of the National Collection of Instruments and Music for use in the YMCA huts. The music section of the YMCA collected materials from musicians around the country and distributed them to musicians in the forces. Many hundreds of these instruments were distributed, to the camps at home, the trenches abroad and battleships at sea. “The donkey cart has just brought another double bass,” said a member of staff. “It brought this,” was the reply, and the speaker pointed to a trombone. A letter lay beside it. ‘This trombone’ it read, ‘has clinging to it happy memories of my youthful music-making. I meant to keep it. But why should I keep it for sentiment when the “boys” can put it to use?" I have read through all the minutes documented in the archives at the University of Birmingham and there is no further record to suggest that the instrument ended up on the frontline, or who played it. It disappeared from 1918–1934, and it wasn’t until the announcement of Sir Edward Elgar’s death that the musicologist Percy Scholes put an advertisement in the Daily Express (24th March 1934) stating the need for Elgar’s trombone to be found and placed in some national museum. The Ealing Branch of the YMCA came forward and presented it as a gift to the Royal College of Music in the same year. Many people seem to think that a great creative artist must be more or less eccentric and a law unto himself. To them probably the most remarkable thing about Elgar, apart from his musical ability, is that he was sane and normal. He liked and enjoyed ordinary things–fun and nonsense, games and sports, birds and beasts–and was temperate and controlled. He loved his wife and he loved his home. I have always thought that his sanity is reflected in his music which, however original, is never freakish and never morbid. This CD is dedicated to three people who have sadly passed away since the making of the recording: Joyce Davey (the aunt who bought me my first trombone), Arthur Wilson (my teacher at the RCM), and Ken Addison (a loving and supportive father). I remember them with gratitude and affection for all their support, belief and encouragement in starting and maintaining my professional career. A very special thanks to David Long, for his generosity in providing Sherbourne Manor and its wonderful piano and surroundings for a week of live-in rehearsing and recording. Thanks also go to Jenny Nex, Curator of the Royal College of Music Instrument Museum, for entrusting me with Elgar’s trombone in order to give recitals and make this recording; and to Michael Rath of Rath Trombones for careful restoration of the instrument. This has been a huge project to pull together, and could not have happened without the assistance of The Royal College of Music, the Elgar Birthplace Musem, The Elgar Society, the University of Birmingham and the Birmingham Conservatoire of Music. Grateful thanks to all these institutions, and to Sally Goodworth, Shelagh Thomson and Mary O’Neill. Extracts from Mrs Richard Powell’s Memories of a Variation have been taken from the Remploy Edition of 1979. This mentions a previous edition of 1937 but gives no details of the publisher. Every effort has been made to ascertain the owner of the original copyrights. Please contact the Publishing Manager of Cala Records Ltd (see inside back cover) for any matters concerning acknowledgments. The extract of the letter from Elgar is reproduced by courtesy of the Elgar Birthplace Museum. The cartoon on page three is used by courtesy of Jerrold Northrop Moore.